Just as the principle of leverage can apply to many different situations and contexts, from bicycles to business process reengineering, the lessons I’m learning from my running coach, Rina, and other world-class athletes also seem to apply to my work as a Performance Measurement Practitioner. The pursuit of excellence in anything, it seems, is based on a core set of principles. I don’t profess to know what they all are, but through running training with my coach, I’ve learned a few that mean a lot to me. I hope they can help you too, in your endeavours to lead your organisation to excel through measuring and achieving what matters. Principle 1: Run the kilometre you’re running right now, not the kilometres you’re yet to run. A weekly training session in my running program is to do a series of 1km intervals, as fast as I can. I started out having to do 5 of them, on an interval of 6 minutes and 30 seconds. If I finished the kilometre in 4 minutes 30 seconds, then I had 2 minutes to recover before starting the next one. 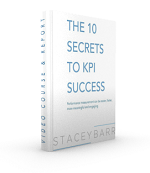 Overwhelm and premature defeat in establishing a powerful performance measurement system in an organisation is caused by a similar problem: you’re thinking about how much there is yet to do, or how much different things should be to how they are now. To pursue excellence, you’re better off focusing just a few smaller areas first – perhaps one team or one strategic goal or one business process at a time. Then you’ll keep building on those smaller successes, to bigger and faster successes. Principle 2: Be bold and push yourself: you’ll be surprised how far outside your comfort zone you can go and you’ll still be okay. My coach Rina calls those 1km interval sessions the ‘vomit sessions’ because the idea is to push yourself to the point of almost throwing up, where you’ve hit your lactic threshold. Rina says that most people don’t get faster because they’re scared to push themselves hard enough. But because our bodies, like any adaptive system, have the default set at degenerate, we have to keep giving it challenges, pushing its boundaries, to shake the default and ask it to achieve new levels of performance. I’ve nearly thrown up several times during these 1km interval sessions, but it was more than worth it to now say that my average times have come down by 20 seconds over 3 months. But I had to trust that I’d be okay if I pushed myself where I’d never gone before, and that my body would handle it just fine. If we want organisational or business performance to shift to new levels, we have to do the same. We’ve got to push the boundaries, push the threshold of what feels possible, be bold enough to go into uncomfortable territory. Nothing will truly change otherwise. Usually, for performance measurement, this means pushing the social boundaries, pushing the misbeliefs and limiting attitudes people have about measuring. Principle 3: When your goal is backed by an action plan, it’s all downhill (so to speak). When you know exactly what to do, when to do it and why you’re doing it, it’s so much easier to get it done. So even though I know some of my running sessions will be very hard and have me doing uphill surges, it still feels downhill because I don’t have to think about how far I’ll run or where I’ll run or how hard I’ll work. I just follow the plan. Too many organisations take an ad hoc approach to performance measurement, not realising that to get it right, and get it right quickly, there is a deliberate process to follow to select the best measures, implement those measures and make it easy to use those measures to improve performance. To pursue excellence in performance measurement, you need a deliberate action plan to design and execute your measurement process, so each week you know what to focus on, what to aim for, and why. Principle 4: Be your goal, be the success you aim for, not just while you’re running but all the time. For me, I can now see that to achieve my running goals, I need to act right now like the person who achieves lots of goals, the person who is always getting better at something, who loves pursuing goals. It keeps me in a mindset of possibility, and strangely, a mindset of enjoying the journey even more than the destination. My business coach, Robert Gerrish, said something like this once: “A leader, a REAL leader, is someone who leads ALL the time, is inspiring ALL the time, is empassioned ALL the time – not just turning it on for 60 minutes. 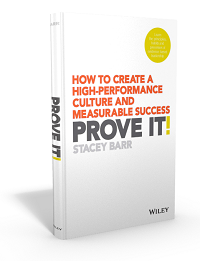 It’s on ALL the time.” That’s how we need to be as performance measurement practitioners. We have to always be that person who loves pursuing excellence in performance. And soon, others just won’t be able to resist that infectious energy and spark. Principle 5: Surround yourself with the best support team you can muster. Luck did play some part in my being able to hire an Olympic athlete as my running coach – Rina lives in my town and is a personal trainer these days. But that shouldn’t discount the fact that hiring her was a smart move. I want the speed, I want the endurance, I want the fitness – more than I was going to ever achieve on my own. Rina knows what she’s doing – her achievements are testimony to that – so I confidently do what she tells me to do. Trusting my coach takes a huge load off my mind in pursuing my running goals. I don’t have to research running training techniques, I don’t have to work out what’s right for me or what’s not right for me. I just focus on doing the best I can at what Rina tells me to do. And that makes the hard work heaps easier. And the same goes for the physiotherapist and masseur and I regularly visit – I trust the work they do on my tired and strained legs and feet. You won’t be able to single-handedly lead excellence in performance measurement in your organisation. You’ll need a team too, of people who believe in your vision, who each bring an important capability to make that vision a reality. You might even need a performance measurement coach, who can guide you out of ruts and around potholes so you reach success much sooner. All in all, pursuing excellence in anything – performance measurement especially – often requires a change in who we are being and how we are thinking, more profoundly than what we are doing. Does one of these principles resonate with you today? Reflect on why it resonates with you, check if there’s an area in your pursuit of performance measurement excellence that feels a little flat, or is falling short. What’s the advice you’d give yourself to pop up out of the rut, or more nimbly avoid those upcoming potholes? Wow! What a great and motivating article. I also run and have been a running coach since September 2009. I love the running analogies. I am not an olympian but I know that the motivation to change comes from within each person. The part of coaching and teaching I find most rewarding is being an eyewitness to the determination in my running students whether they are new to running or seasoned veterans. Seeing them work hard and unfailingly to achieve their goals brings me fulfillment. Your article has helped me learn ways to guide others not only in running but at work. it’s a really cool idea to transfer knowledge / wisdom of sport into the business arena! Your article resonated on a lot of different parts with me and it reminded me to the time when I received my running lessons from one experienced guy in the deep forests near Karlsruhe, a small city in Germany. After having trained for about one year I could run the 10 in about 32 mins. Not counting the vomit sessions, my trainer loved them and after some month my body became adapted I made a huge step forward (I started the 10 with about 40 min). What I wanted also to share was an experience I had some years later. I met a Tibetan Master, Sogyal Rinpoche, and I joined for about 10 years each year one of his retreats, each lasting for about 10 days. He trained me in letting go the believes I have of myself. One of his missions is to support people in developing by using meditation techniques an open mind and heart. When you start experiencing that mind is the ruler and body just follows the mind everything will become much easier when trying to exceed the boundaries of the body. Lots of wisdom in running – like, just get out and do it! Thanks Tommy, Martin and Zoe for taking the time to comment. I think you’ve all hit the same nail on the head: striving for excellence in anything, running and performance measurement included, is mostly about what happens between our ears. Mental focus and belief are infinitely more powerful than physical skill. Stacey, the running is a great example of how you break a major task e.g running a Marathon down into small pieces e.g. each of the training sessions. One important point that I think can also be made is that whilst you have your plan (your training programme) if for some reason you miss a session or something goes awry, do not give up. Review your plan and make an adjustment. It may be that you can still achieve your goal by moving some of your sessions around OR you may have to change your goal. Whatver you do, don’t give up!